Submit a list of references or Bibliography in Harvard format. The Red House epitomises all that the Arts & Crafts Movement represented. It was recently acquired by the National Trust and has been restored as a museum. 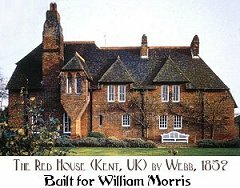 The house itself was designed by the architect Philip Webb, although the owner, William Morris was very much involved in it's planning and design. 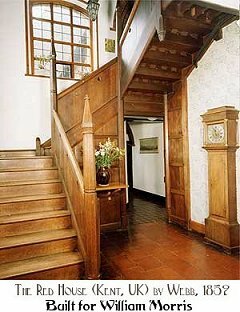 The furnishings and fixtures were intrinsic to the house, and these were designed by William Morris himself, as well as his friends Dante Gabriel Rossetti and Edward Burne-Jones (founding members of the Pre-Raphaelite Brotherhood). The Arts & Craft Movement was politically based rather than evolving as an art/design style. It was linked to the Fine Arts Movement of the Pre-Raphaelite Brotherhood, a "secret" society of artists. The key features were "the cult of the Medieval" and a return to simplicity and restrained beauty rather than the fussy overdecoration of High Victorian style. The Arts and Craft Movement was a reaction against many of the scientific and technological developments that were happening at the time in Victorian England. For example, manufacturing processes had enabled mass production for the first time in industries as diverse as textiles, furniture production and printing. The Movement was opposed to this industrialisation and wanted a return to production methods from earlier centuries - for example, printing wallpapers by hand with wooden blocks. His architectural style was very minimalist for it's time. 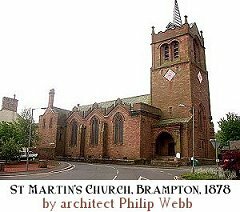 Often his buildings had a Gothic style, although he also experimented with Queen Anne styles too. The most distinctive feature of his work was a lack of ornamentation in a period when the mainstream of design was to embellish wherever possible. Morris built the Red House to fulfill his dream of an Arthurian idyll, but tragically it became all too real, in the tradition of Guinevere and Lancelot. His beautiful wife, Jane Burden (model for many Pre-Raphaelite paintings) is said to have fallen in love with his best friend, Dante Gabriel Rossetti when he came to live with them at the Red House after being widowed. Although Morris couldn't divorce her - it would have been a scandal in Victorian England - they sold the Red House after only five years. The idyll was shattered and Morris, supposedly heartbroken, threw himself into his work. Adams, S., 1987, The Arts & Crafts Movement, London: New Burlington Books. Chartwell Books, 1998, The Pre-Raphaelites, New Jersey: Chartwell Books. Morris, B., 1989, Liberty Design, London: Pyramid. Poulson, C., 1989, William Morris, London: New Burlington Books. 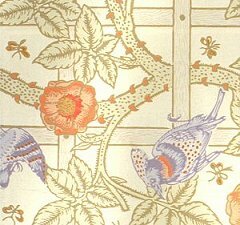 William Morris's first wallpaper, Trellis, 1862. Said to have been inspired by his garden at the Red House.